DONALD TRUMP HAS recognised the disputed city of Jerusalem as Israel’s capital , a historic decision that overturns decades of US policy and risks triggering a fresh spasm of violence in the Middle East. “I have determined that it is time to officially recognize Jerusalem as the capital of Israel,” the US leader said in a speech from the White House. Trump’s announcement plunges the United States into a decades-long dispute over a city considered holy by Jews, Muslims and Christians, and flies in the face of warnings from US allies and leaders across the Middle East. Trump also announced that he plans on moving the US embassy to Jerusalem. However, he added that he remains committed to the Israeli-Palestinian peace deal. 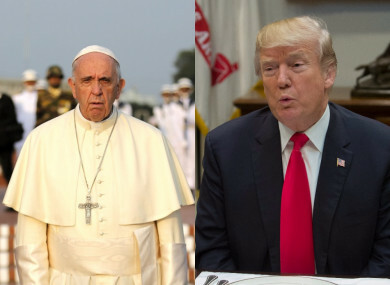 Pope Francis earlier defended the “status quo” of Jerusalem, hours ahead of Trump’s announcement. The pope’s call came a day after he spoke by phone with Palestinian president Mahmud Abbas, the Vatican said without elaborating. Plunging further into a bitter centuries-old argument between Jews, Muslims and Christians, Trump will also order planning to begin on moving the US embassy from Tel Aviv to Jerusalem. “It will take some time to find a site, to address security concerns, design a new facility, fund a new facility and build it,” the official said, indicating that the move will not be immediate. It will be a matter of some years, it won’t be months, it’s going to take time. The status of Jerusalem is a central issue in the Israeli-Palestinian conflict, with both sides claiming the city as their capital, and expectations of Trump’s announcement have roiled the combustible region. In a frantic series of calls on its eve, the leaders of Saudi Arabia, Egypt, Jordan, the EU, France, Germany and Turkey all warned Trump against the move. Anticipating widespread demonstrations, US government officials have been ordered to avoid Jerusalem’s Old City and the West Bank. But Trump’s move comes close to fulfilling a campaign promise and will delight his political donors and the conservative and evangelical base that is so vital for the embattled president. Most of the international community does not formally recognise Jerusalem as Israel’s capital, insisting the issue can only be resolved in final status negotiations. US officials talk of “threading the needle” — fulfilling Trump’s campaign pledge, while keeping the peace process on the rails. “President Trump remains committed to achieving a lasting peace agreement between the Israelis and the Palestinians and is optimistic that peace can be achieved,” a second official said. President Trump is prepared to support a two State solution … If agreed to by the two parties. But critics say Trump’s approach is more like “splitting the baby” and could also extinguish his own much-vaunted efforts to broker Middle East peace while igniting the flames of conflict in a region already reeling from crises in Lebanon, Syria, Iraq, Yemen and Qatar. The armed Islamist Hamas movement has threatened to launch a new “intifada” or uprising. Saudi Arabia’s King Salman warned his close ally that moving the US embassy was a “dangerous step” that could rile Muslims around the world. Israel seized the largely Arab eastern sector of Jerusalem during the 1967 Six-Day War and later annexed it, claiming both sides of the city as its “eternal and undivided capital”. Trump was pushed to act on the embassy as a result of the 1995 Jerusalem Embassy Act, which stated that the city “should be recognized as the capital of the State of Israel” and that the US embassy should be moved there. An inbuilt waiver has been repeatedly invoked by successive US presidents, postponing the move on grounds of “national security” once every six months, meaning the law has never taken effect. Several peace plans have unravelled over the issue of how to divide sovereignty or oversee sites in the city that are holy for Christians, Jews and Muslims. Email “Trump announces he recognises Jerusalem as Israeli capital”. Feedback on “Trump announces he recognises Jerusalem as Israeli capital”.